For Tamayríz López, the devastation wrought by Hurricane Maria on her island - the torn off roofs, 50 days without water or electricity, the stories of neighbors in her hometown of San Sebastián who perished - had shaped her young life, and was the force that drove her, her mother, her stepfather, her sister, and other family members to flee the island and move to the Reading area of Berks County, Pennsylvania, on Nov. 17, 2017. “At some point, I thought I was going to die,” said López, who explained that since she is only 10 years old, Maria was the worst hurricane she had ever witnessed in her lifetime. But for all the ways that Hurricane Maria had affected her, it hadn’t been something she had discussed with others in terms of what her experience had been — not just during the hurricane, but in the upheaval and displacement that occurred afterwards in the move to the mainland. She hadn’t talked about it, that is, until mid-August, when López participated in the week-long Camp Noah program at St. Luke’s Lutheran Church in Reading, PA. She and 36 other children, the majority of them from families that had come to Pennsylvania after surviving the devastating path of Hurricane Maria as it tore through Puerto Rico, discovered a space in which they could both share their experience with their peers who had lived through similar horrors and develop resilience skills to move forward. Alexander Ortiz, 13, of San Juan, Puerto Rico, said that the camp helped him to feel more at home in Pennsylvania, where he, his mother and brother plan to stay due to the ongoing recovery challenges on the island. He explained that he was able to get off his chest the feelings, everything that he had stored up and held onto in the months surrounded by non-Spanish speakers at school and in the community since he first arrived with his family on Dec. 31. And it is fitting, perhaps, that the Spanish word Ortiz used, desahogarse, is the inverse of ahogarse, which means to drown. For Ortiz, as well as other youth who lived through the natural disaster of Maria and are now experiencing the double disadvantage of having to adjust to life in a new culture and language, having an outlet to release those emotions is, in many ways, a matter of embracing life or being stifled by all that they’ve had to witness and absorb in their journeys. According to FEMA data, more than 2,000 evacuee families moved to Pennsylvania from Puerto Rico after the hurricane, making it the second-most popular destination state for Hurricane Maria evacuees after Florida. Pastor Katie Lyon, a local Lutheran pastor who is bilingual and worked to organize the camp, said that the efforts of the Centro Hispano, a nonprofit organization dedicated to serving the Latino community in Reading, made it possible for Camp Noah organizers to connect with the Puerto Rican evacuees in the immediate area to get the word out about the program. 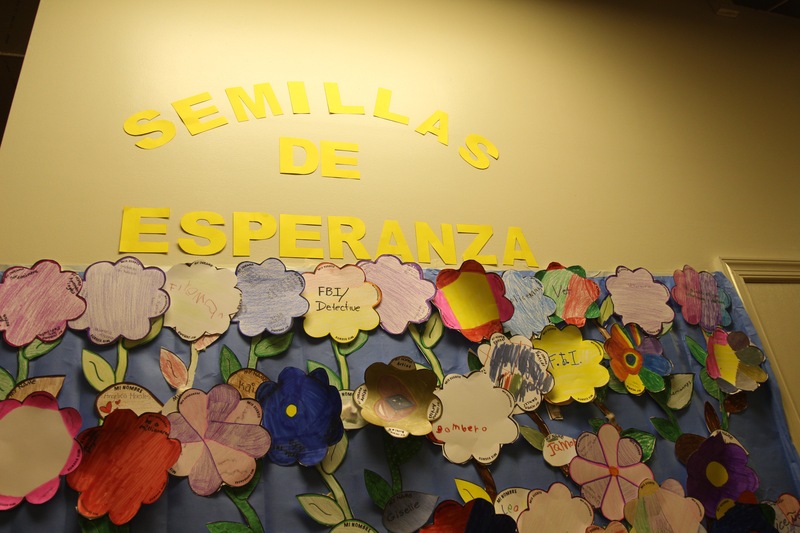 She added that the Lutheran churches in the area also partnered with the center to distribute to all of the campers a resource guide compiled by Centro Hispano, the goal of which is to help families access continued support available to them in the community. 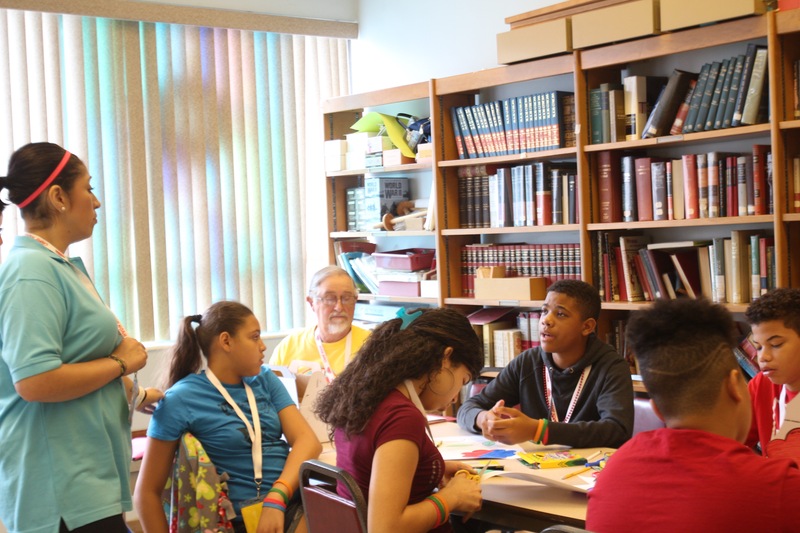 Lyon also noted that she and other members of the Liberty Lutheran churches are hoping to be able to hold another camp for those affected by Hurricane Maria in the Philadelphia area next summer. Kheila Aviles, of Manatí, Puerto Rico, arrived in Reading with her family in January of this year after enduring several months on the island in the aftermath of the hurricane. 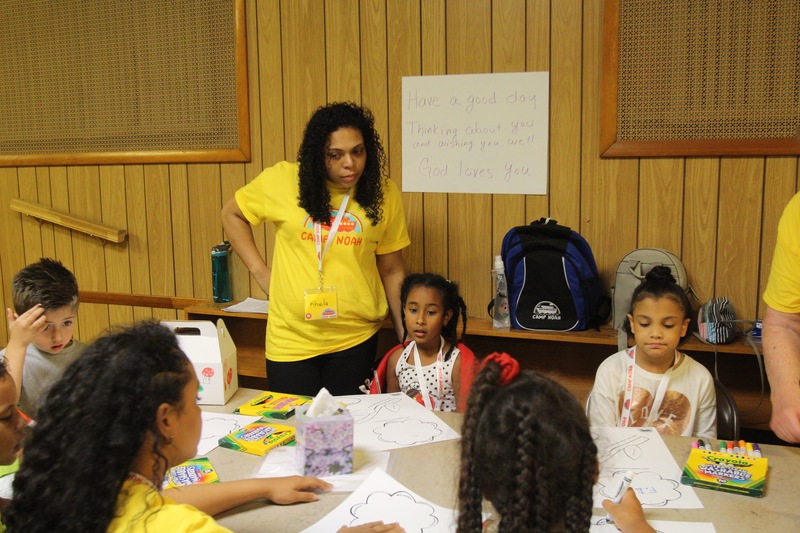 Aviles volunteered at the camp and said that she felt the experience was beneficial to her children, aged six and nine, who participated in the program. “I think that it has been good for them because they’ve learned, they’ve expressed themselves, they’ve taken their mind off of what happened. Because it’s not easy to get used to everything, when you haven’t been here for a long time. It’s not easy to get used to it overnight,” she noted. Liliana Moore, a bilingual community social worker who facilitated different activities and sessions at the camp, said that that process of opening up is a key part of Camp Noah’s work. 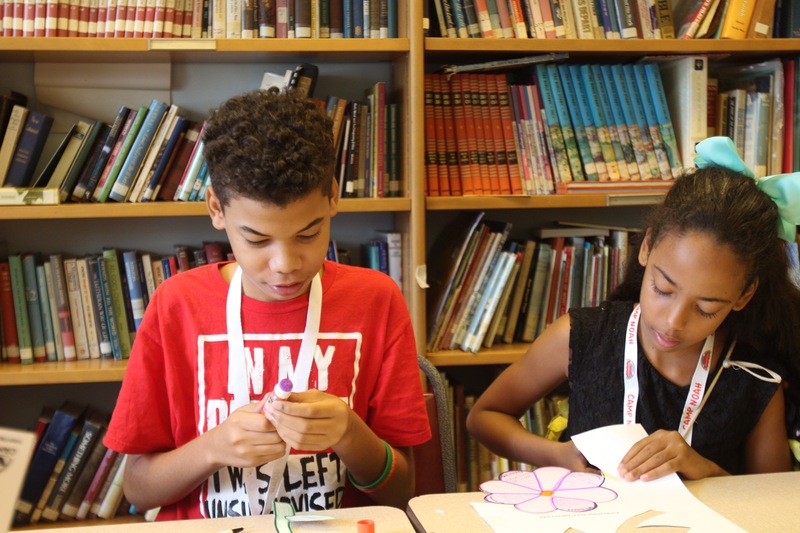 “What we’ve seen, it’s just so beautiful... From day one, we had kids who did not speak, who hardly maintained eye contact, who had their heads down,” said Moore, adding that the camp’s curriculum allows campers to build confidence and feel safe enough to open up in that environment by the second, third, or fourth days — as was indicated by the scene in one classroom on the fifth and final day of camp on Aug. 17. 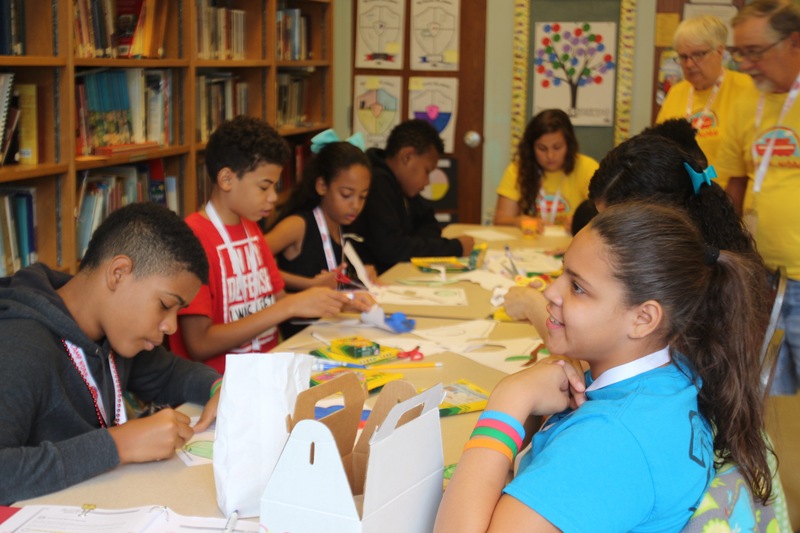 López, Ortiz, and a group of the older kids created artwork for their “wall of memories” and “seeds of hope,” as they talked amongst each other in Spanish about what happened, with Moore facilitating. They shared their memories of what the hurricane winds sounded like to them (a train, a wolf), the long lines for gas, the empty supermarkets, and the desperate search for a signal, a way to contact family and loved ones. And they looked ahead, discussing the future of Puerto Rico — their fears about returning, their worries about what it would mean to stay. Though the future of their families and their island is not clear for many of the children, they are talking about it, out loud, with their peers who understand their experiences. This, Camp Noah organizers say, is a part of the way forward in and of itself.